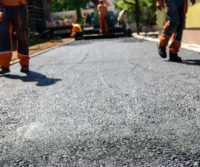 Posts Tagged "asphalt paving in Halethorpe MD"
With spring upon us, this is a perfect season to start those home improvement projects you were delaying all winter. Has your driveway been on your mind? Your driveway takes up so much of your front yard and is very important to the aesthetic appeal of your home. Now is the time to consider a new asphalt driveway. If you are looking for expert asphalt paving in Halethorpe MD, Baltimore, or the surrounding area, please read on. An asphalt driveway should be put down by a professional contractor. First, the contractor breaks up your current driveway, removing all existing materials. Now they have a completely clean surface to work with. Next, they grade your driveway slope to ensure that water runs off the sides or bottom of your driveway. They apply all the necessary materials: the base soil, the crushed rock and the proper thickness of asphalt. Please note: an asphalt driveway takes some time to put down. The base layer of soil and crushed rock should be allowed to settle for a week to guarantee a stronger, more solid base. Additionally, before driving on it, your driveway needs another week to harden after the asphalt is applied. There are several benefits to choosing an asphalt driveway. Asphalt gives your driveway a clean, visually appealing look that enhances your home’s curb appeal. A brand new asphalt driveway increases your property value and likely improves the chances of selling your home in the future. An asphalt driveway offers durability, with an expected lifespan between 12 to 20 years. Proper maintenance of your driveway can be the difference between it lasting 12 years or 20 years. We recommend that you clean your driveway twice a year with a stiff broom and hose to remove debris. Every two to five years, seal coat the asphalt to keep it water-resistant and attractive. Lastly, repair all holes and cracks immediately as they appear. Fix cracks with an asphalt repair material or sealant. For a free estimate contact A&M Asphalt Paving today.